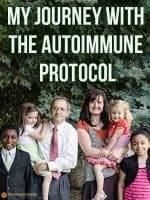 For my autoimmune disease of rheumatoid arthritis, I found so much relief with the Autoimmune Protocol, that I think it needs to be shared with the world. 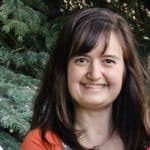 I was diagnosed with RA when my two oldest children were about two years old. I had a problem with it before then, but it wasn’t bad enough to find a doctor and really get it taken care of. By the time I went to the doctor, I could not function in daily life and was in constant pain. I found a lot of relief with the Paleo diet for many years, but something was missing. I tried the GAPS Intro. diet for a month. The problem is, my RA felt fantastic during this time – but I felt increasingly worse overall on the diet. A few months later I figured out that I have a histamine allergy and that’s why I felt so bad on the diet, even though my RA and other health problems were a lot better. The foods on GAPS Intro. are high in histamines. I ended up only doing the 30 days on the Intro. Diet and it’s been a year and I just can’t make myself do it again. For one thing, it was a lot of work constantly making broth and my kitchen is in my garage right now while we add on to our house so it isn’t a good time. But mostly because I still feel really bad every time I eat broth. It’s so annoying because I know how good it is for me. “Hi There, I just wanted to let you know that I have overcome rheumatoid arthritis. I would encourage you to find the source of the inflammation. If you study the causes of inflammation, there are four main ones: toxicity, infection, malnutrition, or injury. In the case of RA you can rule out injury as this is a chronic condition and the injury would repair and the inflammation decrease. So look for the very root cause of your illness. Do you have mercury or lead or any other number of toxicities? Is your nutrition optimal? Do you have an infection? There are more and more studies indicating that there is an infection such as mycoplasma fermentans which has been isolated from the joints of those with RA (https://www.roadback.org/) . But there is still another underlying cause as many people come in contact with this bug and fight it off. Once you have an abundance of this bug and an underlying weak immune system, however, you may need help with something such as Minocin to kill off enough of the bug so that your immune system isn’t so overwhelmed with infection. Have you heard of www.gapsdiet.com ? This plus a short course of the appropriate antibiotics (we found out which antibiotics to use by getting a Complete Diagnostic Stool Assessment done), is how our family recovered from our autoimmune diseases and there were many. We only have a little bit of Chrone’s disease left….two small spots in me and one small spot in my son. I love your blog site and I often pass along the information you share so thank you for the work you are doing! It is far reaching and I do wish you all the best in your recovery to full health! This email was was the beginning of a life-changing journey for me. I honestly started this blog to help other people and never dreamed that one of my millions of readers would one day help me. 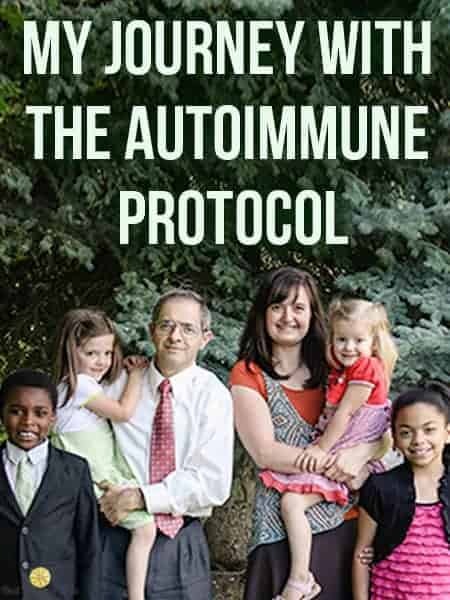 I will forever be grateful to Susan for pointing me in the direction of the Autoimmune Protocol (AP). After receiving this email and exchanging a few emails with her and roadback.org, I found a D.O. (Doctor of Osteopathy) that lives about half an hour from me. He is a good fit for me because he can write prescriptions and all that but understands a lot of the natural treatments. His specialty seems to be using the tools a regular doctor would use but using them in a different way. Let me see if I can make sense of that. When I went in and told him all my RA and other symptoms, he ordered a bunch of blood work (six pages worth on the print out). Out of the ordinary? Kind of. I actually have found it really hard to find a doctor that will actually run blood work. I don’t understand this. They just seem to guess a lot when they could easily run some tests to answer questions and find hidden things. Now, the things he tested for were even more unusual. The day I went to find out my test results was life-changing. He said I had hypothyroid, which I’ve had symptoms of for years but no other doctor would run the T3, T4, the conversions and all that stuff. I’m now on a compounding prescription of T3 and T4 and I love it. Yes, I actually take a prescription now. When I was in college at a very stressful time in my life, I got a really weird sickness for about a week. I couldn’t afford to be sick any longer so my theory is that my body didn’t fully recover from it. It hid the sickness. This is when I think I got Mono. Around 19 years ago. Why do I think this is when I got it? Well, the sickness was different than a regular cold and the biggest thing is my back started bothering me a week or two after. I actually remember the moment when my back started bothering me. I was riding my bike, which I did a lot, and it started bothering me and I thought it was really weird because it had never bothered me before and I couldn’t figure out why, when I had changed nothing, that all of a sudden it started bothering me. This is right about the time I started being friends with my now-husband and I told him and he popped my back for the first time. My back problems have been downhill ever since then. Then the next big event in my life was 14 years ago – my husband I moved from Wyoming to Utah. The move was stressful and somewhere within a month or two of that, I got really sick. I coughed and coughed and coughed for months. My mom finally talked me in to going to the doctor and I tried 4 different antibiotics and none of them worked, other than to tear my gut up and give me really bad Candida. I eventually stopped coughing on my own. I believe this is when I had the strep pneumonia. But, I started having WAY more health problems after that. I always thought it was from the antibiotics and yes, I think they caused plenty of problems on their own, but the main problem was from my body once again hiding my sickness. I can’t even tell you how many health problems I started having then. I have several articles already written about all of them. I gained 60 pounds, I felt horrible all the time, my hormones got worse, I was diagnosed with RA, I had debilitating back pain all the time, food allergies and the list goes on and on. With thousands of dollars and tons of work, I fixed a lot of the problems naturally and/or made the symptoms much less severe by going to chiropractors and other natural doctors. But, as I was sitting there in the doctor’s office that day and he was telling me my diagnosis, I realized that I hadn’t really, really gotten rid of my RA. I happened to be having a flare up that day and I just felt so bad and I just wanted to feel better so bad. Nineteen years is a really long time to feel like you are sick constantly. It just made so much sense. I always swore that I was always sick, even though I didn’t have outward signs of being sick, other than getting sick a lot and having swollen lymph nodes all the time. So, what to do? The solution for me has been so amazingly simple and ironic. I take Doxycycline. It’s an antibiotic. Yes, I swore I would never take an antibiotic again and here I have been taking one for 2.5 months. I will always remember going home from the doctor with a prescription and just crying – crying that it took so long to figure this out and so many years wasted feeling horrible during the prime of my life. But, I was thrilled to finally have an answer that really made sense! I was so mad that the dumb RA doctor didn’t run these blood tests years ago. But I was trying to just let all that go – literally telling myself to “Let it go, Let it go, let the fear inside be gone. . .” It has been so healing and liberating to let the past go and heal and move on and now I want to help all of you with RA and/or other autoimmune problems. You don’t have to live with this. There is a solution. Sure, you are using modern medicine but you are using a drug in an unconventional way and it’s hard for doctors to think differently and accept treatments that differ from the status quo. The AP has been around for quite a while yet it is still relatively unknown and I’m sure that all the millions of people out there with RA and other autoimmune diseases would like to know about it, but who’s going to pay to publicize it? All the drug companies that make the drugs for RA? I don’t think so . . .
For the six weeks I was on 100 mg of Doxycycline and I hated it. It hurt my tummy and I got really nauseous. It’s a big pain to take to have to eat it on an empty stomach then wait at least an hour to eat or take it 2-3 hours after you ate and an hour before you eat again. Huge pain. I found it easiest to take it first thing in the morning on an empty stomach but that meant I was in pain, trying to hold really still for an hour until I could eat. Not fun. After a while I started taking it between breakfast and lunch but it was hard to remember and I didn’t feel like it worked as well. Then after the first six weeks my D.O. upped my dose to 150 mg, which for some reason is time released. It’s so much better. I forget that I take it most of the time, plus it’s stronger so I can feel it working better. My doctor said I would probably experience some major detox symptoms. I haven’t had very many, but I’m sure that’s because I knew it was a possibility and have been actively detoxing with clay baths, clay pills, ionic foot baths and several other things like that. I have now been doing it for 2.5 months and I’m just starting to pull out of the “yucky” phase though. While on the medication, I don’t get flare ups, which is super-huge. I ended up going off it for a few days between the 100 and 150 mg dose waiting for my doctor appointment and I got sick and my RA flared up really bad. My DO said this is a sign that I was not done and to go back on at an increased dose. He said there is a good chance I will be on the antibiotic for at least six months. He said normal treatment time is six months to two years. Even though I haven’t had flare-ups, I have been in pain worse than normal. My hands and back hurt a lot. If I just touch my spine it hurts. My skin has been really sensitive, sunburns easily and itches. One side effect I have not experienced though is Candida. I normally get really bad Candida on antibiotics but this has not been the case with Doxycycline. Apparently, this is normal because of the type of antibiotic it is. It’s also ok to take long-term and you don’t get resistant to it. Just the last week or so, the pain has been a lot less and I’m beginning to have hope that this is really, really going to work. I have moments where I forget about my RA. I’m so used to always feeling it in my whole body all the time that it’s really weird when I don’t feel that. I am especially excited that I seem to be more and more tolerant of foods that I didn’t use to be able to eat and my RA doesn’t get worse after eating. So I have hope that it’s also killing my bad gut bacteria, which is helping my body kill my leaky gut on its own, with the help of Perma Clear. I also take a high-quality probiotic 3 times a day all month long to replenish the good bacteria it’s killing. So, yes. I am getting better every day thanks to western medicine, which is still weird to me. You may wonder why I don’t just stop taking the antibiotic and go natural instead. Well, I’m choosing to do a double whammy in this case. I’m killing these bacteria and viruses any way I can. The DO said the antibiotic will take care of the bacteria, which I know causes a lot more symptoms for me than the virus, but that hopefully over time my body will be able to fight the virus on its own. She said that can take at least a year because of how bad I was. So, I’m taking essential oils to help speed up that process and to help my body fight both the bacteria and virus so I won’t have to take the Doxycycline for as long and so I can fight the virus, which a drug can’t do anyway. It seems to be a winning combination. I am about a week away from finishing six months on Doxycycline. I continue to slowly improve. My right hip, which used to bother me so much, is finally starting to stay in place for at least a few hours at a time. I have very little pain from the RA now, mostly just soreness from my hips and shoulders being out of place. But I’m gradually feeling like my body is not attacking itself all the time. My D.O. wants me to do three months of two different antibiotics, which I can’t remember the name of right now. Then after that, he wants me to take a break from the antibiotics from the summer. So I have some freedom and so I can be in the sun for more than ten minutes without feeling that I’m bright red. Then in the fall, I am going to go back and see how I do over the summer. I finished the antibiotic protocol about six months ago. After I finished it and went off the antibiotics to see how I felt, I felt horrible. I was really frustrated that I went through all that I did and still had the problem. What my doctor didn’t tell me is that he didn’t think I would feel good. Really wish he would have told me that. Anyway, I went back and told him I felt like the antibiotics must not have worked and I must still have some bacteria or virus left. He said it’s normal for your body to keep attacking itself, even though there’s nothing to attack. So he started me on 4 mg of Naltrexone. This drug was made to help with opioid addiction and withdrawal and alcoholism, but they have found that if you take doses much, much smaller than intended, it actually helps with autoimmune disorders because it helps teach your body to stop attacking itself. He said I would need to be on Naltrexone for at least two years for my body to re-learn how to behave properly. It took about a week for it to get up to full strength, but now that it has, I feel fine and I don’t know of any negative side effects. So the conclusion of this article is that the Autoimmune Protocol worked. Who knows if it will stick (I could always get sick again) or if we got every last little bit of infection, but my hope is that by taking care of myself, I will be able to stay RA free. I hope this article helped you and that you too can experience relief from your autoimmune disease. My old naturopath literally left the country so I found a new one because I have felt like I don’t have RA anymore and I wanted to see what he would say. He doesn’t test for things like chronic viruses and bacteria but he did do a test on me that measures how bad your RA is and if you have it at all. My test came back negative! So there it is. Proof that it is actually gone and I don’t have RA anymore! It worked! After the test that the RA was negative, I got brave and stopped taking Naltrexone to see how I would feel and I feel great! I still have some chronic back issues I feel the RA contributed to but I feel like I’ve been slowly making progress and healing my joints and eventually may not even have those problems. Hello. Very interesting blog and info on doxycycline. I did 6 months doxycycline and got myself into remission but relapsed very bad. Always wondered if I shoukd try longer but scared I get sicker (even though I’m unable to work etc). Yes! After about 1.5 years it was all killed but I still didn’t feel great so I did a low dose naltrexone for about two years to re-train my body to stop attacking itself. I’ve now been off that for about a year and feel great and got tested about six months ago for RA just to make sure I wasn’t imagining things and the test came back completely negative. I also did a ton of essential oils and other things in there to make sure I got every last bit of it and continue to be really good about things to make sure it doesn’t come back. I have many autoimmune diseases and feel sick nearly everyday. The way that you described that you knew after the mono that your illness had changed is very interesting. I have a similar story regarding that and yes I do believe I’ve had physiological problems since I can remember as a child. I have many physicians with my neurologist being my true primary care dot. Trying to manage my crazy body. I just wanted to say thanks for your insight n you’re not alone. You’re welcome and good luck on your journey. I wanted to thank you for your blog. My doctor and I are working to diagnosis my autoimmune. I stopped by to find a pumpkin pie recipe and found so much more. I have been on the paleo diet for one year, and I have seen results. I am looking for better health even still. I want to talk to my doctor about the protocol. Thank you so much for your transparency in your health journey. I’m so glad to help. I think everyone should know about it and I hope you can find some good help!